BTG hasn’t made too many games, at least when you compare them to bigger brands like Netent, Microgaming and Novomatic. But I think we can all agree that it isn’t the amount of games that counts… It’s all about how good they are! 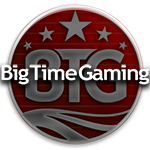 If Big Time Gaming would have a slogan, it would have to be something like ‘quality over quantity’, because that’s what this brand seems to be all about. They are responsible for only a handful of slots and they’re pretty much all top notch. If you can believe their website, Big Time Gaming was set up by a couple of different industry thought leaders with plenty of experience in the development of casino games. The CEO named Nik Robinson had been around since 1996, when he founded New Tech Media. This company was eventually sold to News Corp and it then merged with Orbis to become Openbet. The second person behind BTG is called Huw McIntosh and he’s the CTO. He had also worked in this particular industry for over ten years, with both New Tech Media and Openbet. The last person to mention is Ian Schmidt, who is the creative director. He joined the company after working with Rock Star Games. The office of this developer is based in Sydney, which is a bit of an exception to the rule. Most casino software brands are European, after all, so it’s hardly standard to find one that operates from the other side of the world. And they don’t have a bunch of offices either. Unlike some other developers, BTG works with a relatively small team, which is also the reason why they haven’t produced that many titles, although they are very consistent when it comes to quality. Let us first make it clear that BTG does more than just slots. They also develop games for government lotteries and some of the world’s largest online casino operators in strictly regulated markets. And as if that isn’t enough, they also make Tapcards. Well now, you might be thinking to yourself: what are those? To make a long story short, Tapcards are like scratch cards, except they are more suitable for the digital age that we live in. Big Time Gaming had previously created a number of such games which were firstly released for mobile devices and they are extremely fun to play. They will provide you with a fair chance to win a progressive jackpot with every card you purchase, while you can also enjoy remarkably good-looking features while you’re playing. Some examples of these Tapcards are Dragon Born, Diamonds, Lucky Streak, Queen of Riches, Starquest and Gold. As mentioned before, Big Time Gaming hasn’t made that many games when compared to other big developers. But the games that they did make so far are absolutely amazing. One of their most popular slots is called Bonanza. It has a ‘gold rush’ theme and a game setup with variable reels, meaning the number of symbols per reel might differ with every spin. On top of that, a little train will come passing by continuously on top of your game screen, which will give you even more symbols with which you can make winning combinations. This will give you an unprecedented 117,649 different ways to get a win, which may also happen several times in a row, considering the fact that the Bonanza slot also offers a feature with falling symbols. In addition to all of that, there are also scatters to be found on the reels, and if those spell the word ‘GOLD’ then you will instantly qualify for 12 free spins or sometimes even more! During that bonus game, which is the place where you can use those free spins, there are even more bonus features that you can make use of. This is the moment when you get to play with the so-called ‘unlimited win multiplier’ feature. That feature will increase the multiplier that applies to your winnings with 1x every time you get an explosion in your screen and this may end up with bigger winnings and even more free spins. If you like this type of game, then you might also like their Extra Chilli slot, which follows the same principle, except with a couple of adjusted bonus features and slightly different mechanics. And in addition to those two videoslots, you might also want to try Danger High Voltage, as that one also gained a lot of popularity since it was created not too long ago.